Twisted language, go for AutoHotkey instead. A new Portable version will be released next week. Thanks for reporting. Also the instructions for manual extraction are pretty clear. I have tried for over an hour to get the portable version installed correctly but have been unable to do so. I attempted the automatic version but did not successfully "drop" the two extra downloads on the GUI once I ran autoit-creator. I tried the manual install and it did not work either. Hopefully someone will inspect the readme file and the introduction by guinness for missing or misplaced instructions. I love AutoIT. Very powerful program that makes it simple to automate computer tasks and build simple programs. 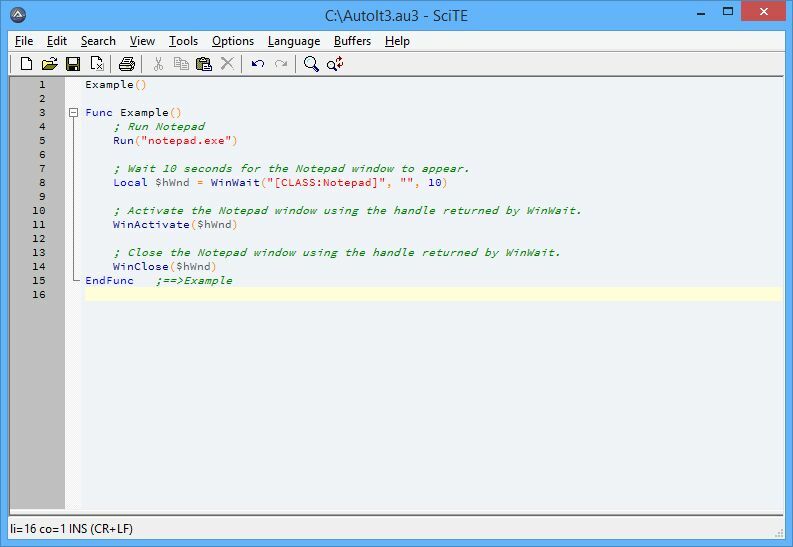 For portable version of Scite it is enough to set environment variable SciTE_HOME. AutoIt is the programming language used by programs like AI RoboForm which is the most popular program to save all data from forms, and to login automatically with one click, and so on. I am creating a program just with autoit programming just like roboform. this program I found looking for a tasker parellel. When I first fi=ound out what it really was...I got addicted within 5 minutes!! An amazing program with capabilities I haven't even heard of! Fantastic program impresses me more every time I use it. It also impresses my boss ;-) gone are the days when I would spent half a day writing a small utility in C, more like half an hour these days just knock up a quick script and away you go. Since I started using this I've built several small tools that have taken long processes and reduced them to one click. One tool turns a 20minute long manual process into one click. A great tool which can save a lot of time. Impressive. I have autohotkey instead of autoit, cause of it's hotstring capabillities. Both (autpit and autohotkey) are working from my USB U3 stick. This is a great tool. I've got a couple systems that are a pain to log into but this makes it only a click or two.